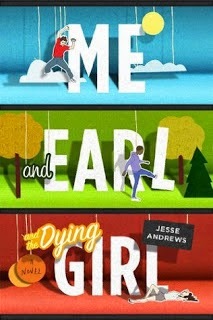 It feels like it would be impossible to write about Me and Earl and the Dying Girl without comparing it to The Fault in Our Stars, one of my favorite YA novels of all time. Both feature teens with cancer, are told from a humorous and sarcastic perspective, and make the reader's feelings run the entire range. I had the spectres of Augustus and Hazel on my shoulder as I read, but it didn't prevent me from enjoying Jesse Andrews' entertaining novel. I was fortunate to spend much of high school hanging out with boys who made funny and disgusting jokes, obsessed over bizarre movies, and showed their sweetness in unexpected ways and moments. All of these descriptions apply to our narrator Greg and his best friend Earl. When Greg's mother forces him to hang out with Rachel, an acquaintance who was diagnosed with leukemia, the goofy movies that they make take on more meaning. The embarrassing films make Rachel happy and help Greg and Earl find more direction in their lives. The plot meanders in a fun way, but the best part of the novel is Greg's voice. He is sarcastic and self-deprecating, with comments sprinkled through the book like, "This entire paragraph is a moron" and "I wanted to eat a power tool." The disgusting comments that the boys make are too graphic for my sixth graders, but older readers will eat it up, especially male reluctant readers. They had me cracking up and thinking of to which friend I should recommend this book first.